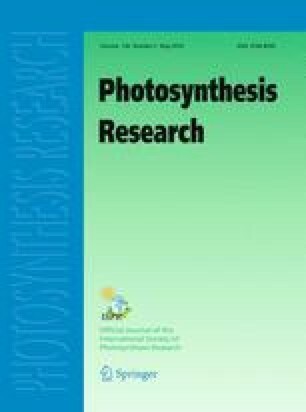 The yield of photosynthetic O2 evolution was measured in cultures of Dunaliella C9AA over a range of light intensities, and a range of low temperatures at constant light intensity. Changes in the rate of charge separation at Photosystem I (PS I) and Photosystem II (PS II) were estimated by the parameters ΦPS I and ΦPS II . ΦPS I is calculated on the basis of the proportion of centres in the correct redox state for charge separation to occur, as measured spectrophotometrically. ΦPS II is calculated using chlorophyll fluorescence to estimate the proportion of centres in the correct redox state, and also to estimate limitations in excitation delivery to reaction centres. With both increasing light intensity and decreasing temperature it was found that O2 evolution decreased more than predicted by either ΦPS I or ΦPS II. The results are interpreted as evidence of non-assimilatory electron flow; either linear whole chain, or cyclic around each photosystem.